I’m interested in studying various secessionist movements in American history. Here’s one I just discovered. I’ve transcribed the awkwardly worded marker and have a photo of it. 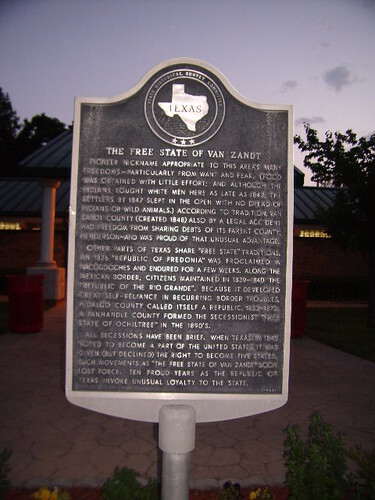 (I go through Van Zandt County often). and was proud of that unusual advantage. of Ochiltree” in the 1890’s. given (but declined) the right to become five states. invoke unusual loyalty to the state.